PNEUMSYS offers complete End to End solutions in the compressed air industry from point of generation to point of application. PNEUMSYS is dealing withCEJN closed safety reels are a premium collection of reels for compressed air, water, and electrical cable reels. 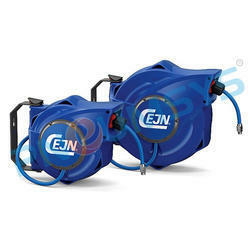 CEJN safety reels provide users with both maximum tool output and safety in the workplace with their durable exterior housing, slow retraction feature and unique soft stop-ball. The reels are easy to maneuver and offer 180 degrees of movement and parking position. We keep it simple: they are easy to install, whether mounted on ceiling or wall and can be disconnected from the wall bracket if necessary. The patented closed safety reels are developed and produced in Sweden. Each component in our safety reel range and their function is carefully considered to provide you with the best product on the market. 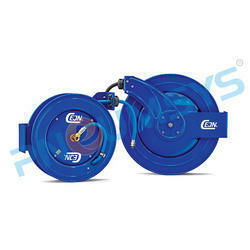 Compressed Air Safety Hose Reel is a durable reel that provides excellent performance thanks to its full-flow patented design that, unlike most reels, does not restrict flow. This provides maximum power to the customer’s tools, saving them both energy and time. This hose reel is ideal for a safe workplace. The slow retraction function, hose guiding, PUR hose, soft stop-ball to prevent tripping and anti-kink safety features are just a few examples of what makes these safety reels the best on the market. The reel can swivel 180 degrees allowing the operator to move around freely, and the slow retraction makes it safe and easy for anyone to handle. If a hose needs to be changed, this can be done easily thanks to its smart design. Compressed Air Open Hose Reels are designed for safe performance in the workplace. The heavy-duty spun discs with rolled edges make the reel safe to handle and minimize damage to the hose due to sharp edges. The reel retracts the hose safely and steadily, using a built-in safety clutch. The open hose reels have a longer length and larger hose dimensions, thanks to a robust frame and compact high flow swivel. The swivel is placed outside the shaft for easy installation and maintenance. To ensure long-lasting durability, the heavy-duty steel has a powder coated finish for harsh and challenging conditions. Enclosed factory-adjusted spring cartridge for safe and easy replacement. Another example is the unique shaft with a dual support system for maximum stability.